A gangster is hailed a hero on his return home from World War Two and is determined to stay on the straight and narrow from now on. Unfortunately, he is summoned to testify against his old partners in crime, placing his life in danger as former associates try to silence him. Drama, starring Brian Donlevy, Claire Trevor, Forrest Tucker and Vera Ralston. This nickel-and-dime gangster picture was knocked out quickly by Republic Studios following the 1950 report by the Senate Crime Investigating Committee. Chaired by Senator Este Kefauver, the report not only exposed organised crime, but also severely criticised Hollywood violence and its glamorisation of criminals. 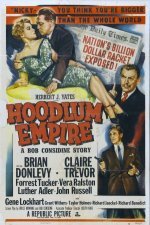 Accordingly, the film takes pains to establish its serious credentials and moral strength as Brian Donlevy, playing a Kefauver clone, digs deep into the syndicate's dark secrets.